We at Azul Reception Hall, offer our customers with a vast range of event management services along with a huge, beautiful venue. So, if you are planning to organize an event book our venue. You will be glad to see that we will help you organize the whole event as per your taste and requirements. 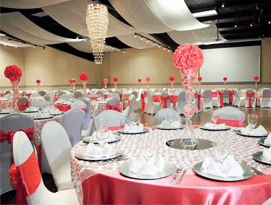 Our highly skilled team specializes in decorations and we decorate the venue to make a strong impression to your guests. Some of the décor elements we provide are, flowers, chair covers, table linen, dinnerware, center pieces, lights and a lot more.